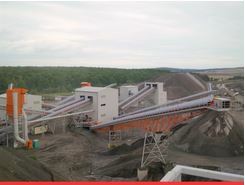 The rocks conveyed at this large and modern quarry are both large in size and very hard, and as a result have a very high impact on conveyor belt. 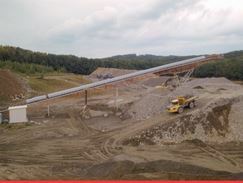 One conveyor in particular, situated next to the crusher, was particularly affected, with belts lasting an average of less than two months. We specified Dunlop UsFlex 1000/2 8+3 12mm belt. UsFlex has an innovative heavy duty carcass that out-performs traditional multi-ply belts in almost every respect. The major advantage of UsFlex is its extremely strong ‘straight-warp’ construction giving it superior impact, rip and tear resistance, first class operational performance and extended life span. 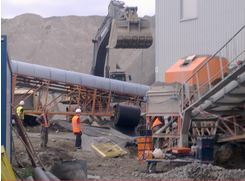 The total length of the conveyor was longer than the standard roll length, which meant a first splice on the ground before using heavy machinery to pull the weight of the belt in position. We were able to do this to our pre-agreed schedule and completed the task smoothly without complications. 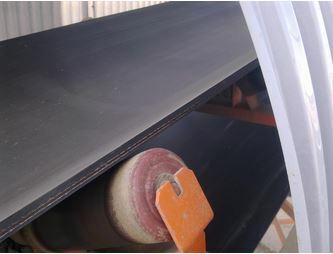 The UsFlex belt was installed and even after exceeding the average of two months belt life by an additional 18 months, the belt still showed no signs of significant damage or wear.